143 meat cows from Fukushima went to at least 35 prefectures (out of 47) and counting (Kyodo News English 7/17/2011). Assuming 300 kg per cow, and you have 43 tonnes of beef plus unknown amount of cows' innards (kidney, liver, heart, etc.) that the Japanese also eat. All these cows were fed with radioactive rice hay. The rice growers sold the rice hay, and the cattle farmers fed the rice hay, because there was no government regulation on radiation concerning the storage, sale, and use of the rice hay. The authorities will probably have to find out where else the radioactive rice hay has been sold. The rice hay in Koriyama City in Fukushima tested 500,000 becquerels/kg of radioactive cesium, enough to contaminate non-contaminated cows elsewhere in Japan. Regarding the high level of radioactive cesium detected from the rice hay that was fed to the meat cows at a cattle farm in Asakawa-machi, it was revealed on July 15 that the rice producer group in Shirakawa City (which is located adjacent to Asakawa-machi) sold the rice hay to the cattle farm. Both the cattle farm in Asakawa-machi and the rice producer group in Shirakawa City say there was no instruction from the national government or the Fukushima prefectural government regarding the storage and the sale of the rice hay. The radiation testing of cattle feed has been done only on grass feed that has grown after the Fukushima I Nuclear Power Plant accident, but the rice hay was never considered for testing. It turned out that the high level of cesium detected in the meat cows from Minami-Soma City was also due to the rice hay fed to the cows. The government's lax testing procedure is now coming to light. I do have sympathy for cattle farmers and their suppliers in Tohoku, but when I read the news I am disappointed that they simply followed the guidance (in this case the lack thereof) from the government and not used their common sense that the hay sitting outside or rolled after the Fukushima accident might be contaminated with radioactive materials and it would be better to treat it the same way as the grass feed, which was regulated. Instead, they decided to use the rice hay, or sell it, because the government didn't have any rule on it. I also understand the farmers' situation that there was nothing else to feed their cows, since the supply of cattle feed got interrupted by the earthquake/tsunami and then by the Fukushima accident. So they were trying to find a way to feed their cows, and they found the rice hay, which was outside the regulation. So they fed the cows with the rice hay and hoped for the best. If the grass feed that was growing outside since the accident was contaminated, it doesn't take much imagination to figure out that the same radioactive materials might be also falling on the rice hay. You may ask, "What should they have done, then? Let the cows starve?" I don't know. But they should have raised bloody hell demanding the government, the prefecture, TEPCO, anyone at all anywhere, provide them with clean feed. Instead, they persevered, quietly figured out the way to save the cows. A very Japanese way. However, there's another "baseless rumor" floating around: That the radioactive rice hay is a red herring, and the real culprit is the well water that the cows had been drinking. But the government, both national and prefectural, would dare not say that and dare not test it because they are planning on forcing people back into these areas with the declaration of the "step 1" of TEPCO's "roadmap" having been successfully completed. In one case, the rice hay that the cows ate had 500,000 becquerels/kg of radioactive cesium. Professor Kosako's "chaotic harvest season" must be now. 84 more meat cows from Fukushima that ate highly radioactive hay were discovered by Fukushima Prefecture, as the prefectural government started to test rice hay fed to the cows. Fukushima Prefecture announced on July 16 that 84 additional meat cows that had been fed the potentially radioactive rice hay were shipped inside Fukushima, and to Tokyo, Saitama, Yamagata, and Miyagi Prefectures. According to the Fukushima prefectural government, the cattle farms were located in Koriyama City (2 farms), Kitakata City (2 farms) and Soma City (1 farm). The rice hay from one farm in Koriyama City tested 500,000 becquerels/kg of radioactive cesium. In the farm in Soma City, the hay had 123,000 becquerels/kg cesium, and in Kitakata, 39,000 becquerels/kg. These cities are much further away from Fukushima I Nuclear Power Plant than Minami-Soma City, where the first case of radioactive beef was traced back. If the rice hay left on the rice fields accumulated that much radioactivity, particularly in Koriyama, it is definitely not fit for humans to remain. Not to mention the rice field is not fit for growing rice, though it is far too late, as the rice fields in Tohoku are already long planted. 1,770 becquerels per kilogram. That's the first since the government started the sample testing of food items. Date City is more than 50 kilometers northwest of Fukushima I Nuclear Power Plant. The Ministry of Health, Labor and Welfare announced on July 15 that 1,770 becquerels/kg of radioactive cesium was detected from shiitake mushrooms grown indoors in Date City, Fukushima Prefecture. The provisional safety limit is 500 becquerels/kg. Shiitake mushrooms grown in Motomiya City in Fukushima also tested 560 becquerels/kg of radioactive cesium. Already, 16 municipalities in Fukushima Prefecture restrict the shipment of shiitake mushrooms grown outdoors. This is the first time that shiitake mushrooms that were grown indoors tested above the safety limit. The national government will consider the shipment restriction. Where did this cesium come from, if the mushrooms were grown indoors? Is the indoor air just as contaminated as the outdoor air in Date City? Or was it the mushroom substrate blocks (for indoor cultivation) that were contaminated? In the meantime, the minister in charge of the Fukushima nuke accident and the assistant of PM Kan apparently told the governor of Fukushima that the so-called "step 1" (stable cooling of the reactors, among others) of the so-called "roadmap" by TEPCO has been "successfully completed" (link is in Japanese). July 17 is the so-called "deadline" to so-called "complete" the so-called "step 1". Upon the so-called "completion", the government is set to announce the reduction and/or elimination of the "emergency evacuation-ready zone". Never mind that is where the radioactive cows that ate the radioactive rice hay come from. Date City was not even in the "emergency evacuation-ready zone" until June 30, even though the air radiation level had consistently measured high, the level of "planned evacuation zone". An old "baseless rumor" (back in May) that no MSM mentioned (not even to refute it), although bloggers cited the passage. But as the rice grows in the rice paddies in Kanto and Tohoku and more and more cows are found radioactive because what they ate was highly radioactive (rice hay), it may be worth keeping it in mind, just in case. As far as I've checked, the report has never been "proven", but never been "disproven" either. Also, keep in mind the warning of Professor Toshiso Kosako, that there will be "a chaos" in the fall harvest season. According to the private survey by a food company, an extremely high level of radiation, order of magnitude higher than what the government has been reporting, has been detected in the soil in the rice paddy more than 50 kilometers away from Fukushima I Nuclear Power Plant. The food company says it is withholding the information for now because it may cause panic, but it says the survey has also found a high level of plutonium in the same rice paddy soil. There has been no follow-up to this report. Back in May, almost all tweets on the subject in Japan were from people who outright dismissed the report as "baseless rumor" and criticized Japan Business Press for fear-mongering. "There's no way plutonium can travel outside the Fukushima plant!" was one typical tweet. (Never mind it did.) "They are manufacturing the story" was another. The meat from the cows that ate highly radioactive rice hay in Fukushima has been shipped, sold, and consumed in many cases in 26 prefectures in Japan. There are 47 prefectures in Japan. When the news first broke, the meat was supposed to have been sold in only several prefectures; then 8 then 10, now 26 and counting. People, from Mayor of Yokohama City on down, say "We thought it was safe because it was being sold in the market." Tokyo, Chiba, Kanagawa, Saitama, Gunma, Tochigi, Ibaraki, Niigata, Nagano, Miyagi, Yamagata, Iwate, Akita, Fukushima, Aichi, Ishikawa, Fukui, Yamanashi, Shizuoka, Osaka, Kyoto, Mie, Hyogo, Ehime, Kagawa, Fukuoka. The Japanese people who are against nuclear power plants had better start demonstrating against radioactive food and radioactive garbage, among other things, that have been forced on them through the government action (like raising the safety limit for radioactive garbage ashes) and non-action (like not testing rice hay for radiation). They may get their wish of nuke-free Japan, but unless they start to fight the small details right now, the nuke-free Japan may become inhabitable. Something is going wrong. TEPCO has started to use fresh water taken from the river to cool the reactors, because the treated water that it has been using is running low. TEPCO announced on July 15 that the company started to use the fresh water from outside source to supplement the treated water it has been using to cool the reactors for two weeks. The contaminated water treatment system at Fukushima I Nuclear Power Plant is not functioning well. If the outside water is used, that will increase the amount of contaminated water. TEPCO is trying to identify the cause of the problem. The system can process 50 tonnes of water per hour. During the one week that ended on July 12, however, the rate was 37 tonnes per hour. TEPCO stopped the system at 5:14AM on July 15 to expel the air out of the pipes and restarted the system at 2:21PM, but the operating rate still remains at 39 tonnes per hour. As the result, the amount of treated water in the storage tank has dropped to 35% of the full capacity, so TEPCO replenished the tank with 570 tonnes of river water to bring it to 63% capacity. If outside water is added, the contaminated water will increase. 63 minus 35 equals 28. 570 tonnes equal 28% of the capacity. So the tank holds 2,035 tonnes. The Oxford PhD governor strikes again, this time in New York, telling green tea lovers in the city that Shizuoka tea is safe because it has tested below the safety limit and it's good for their health. He also reminds them that Shizuoka is very far from Fukushima. I suppose there aren't many green tea lovers in New York who read my blog. If they had read my blog, they could have told the governor what he was saying was plain wrong. Governor Heita Kawakatsu of Shizuoka Prefecture joined a gathering of green tea lovers in New York on July 14 and appealed the safety of the teas grown in Shizuoka Prefecture, the largest tea producer in Japan. The US is the largest market for Japan's tea export with 46% share. The governor said he wanted to dispel the anxiety due to the Fukushima nuke accident and appeal the safety directly to consumers in New York, where the Japanese food is popular. Governor Kawakatsu explained that Shizuoka Prefecture was far away from Fukushima Prefecture where the accident happened, and that the survey of the dried teas in the prefecture's tea growing regions showed that the levels of radioactive cesium were below the safety limit. He said, "Shizuoka's tea is not only safe but good for your health." At the gathering, there were demonstrations on how to enjoy green tea in different ways. The Tea Association of the US's chairman said, "There's nothing in the world like green tea from Japan. If we upload the data [that the governor has given us] to our homepage, the sale of green tea will be back to normal." 1. Shizuoka is far away from Fukushima, so what? That does not change the fact that radioactive materials have been falling in Shizuoka since the Fukushima blowup, and hasn't stopped at the prefectural border (although initially some people in Shizuoka actually claimed that the Hakone Mountains blocked the radiation). 2. The statement that "the levels of radioactive cesium were below the safety limit" is plain wrong. French authorities confiscated the green tea grown and processed in Shizuoka Prefecture when that tea tested over 1000 becquerels/kg of radioactive cesium, twice the loose safety limit of Japan and the EU. Also, the tea from Warashina District tested higher than the 500 becquerels/kg limit, which was first discovered by Radish Boya, an online grocer in Tokyo. 3. Standard? What standard? The radiation safety limit for food in the US is 170 becquerels/kg. Of all teas from Shizuoka's tea growing regions, only 4 would be considered safe, being below 170 becquerels/kg. The data is right there in the Shizuoka prefectural government website. If the governor tries to get away by saying the radioactive materials in the brewed tea in a teacup tested below the safety limit, that's also wrong. The Shizuoka government website also has that data, which shows between 1.6 and 14 becquerels/kg of radioactive cesium. Since it is water that is used to brew the tea, we can translate this as having 1.6 to 14 becquerels/liter of radioactive cesium. It sure clears the Japan's extremely loose standard after Fukushima, which is 200 becquerels/liter. However, the US standard for drinks is 0.11 becquerels/liter. None of the Shizuoka tea, even when brewed, would pass the safety standard of the US. Several would fail the WHO standard, which is 10 becquerels/liter. Maybe the Tea Association chairman didn't know about the standards in the US. Or maybe the strict standards have been modified quietly in the US just like the EU did. The chairman is right in saying "There's nothing in the world like green tea from Japan." There's nothing like it, but unfortunately not in a sense he probably means. An anonymous reader linked the FDA document on the US standards on radionuclides. It looks to be the standards in the time of nuclear emergency (I could be wrong), and for food items, for adults, the intervention level for radioactive cesium is 1,200 becquerels/kg, and the level of concern is 370 becquerels/kg. The document is here. One post ago, I wrote "The on-again-off-again water treatment system is finally on again". Well that was premature. It's off again. According to NHK Japanese (7/15/2011), after the contaminated water treatment system was restarted after 30 hours in the evening of July 14, TEPCO noticed that the system was operating at a much reduced rate (37 tonnes/hour) than the system was designed for (50 tonnes/hour). So the company stopped the system in the morning of July 15 and is investigating. No information as to which part of the system is having a problem, Kurion or AREVA. Well, either NHK or TEPCO is not telling the truth, because 37 tonnes per hour is 74% operating rate, and that has been about the rate of operation anyway for the system. So why would this alarm TEPCO? #Fukushima Water Treatment System: Toshiba's Long Tall "SARRY" to the Rescue! 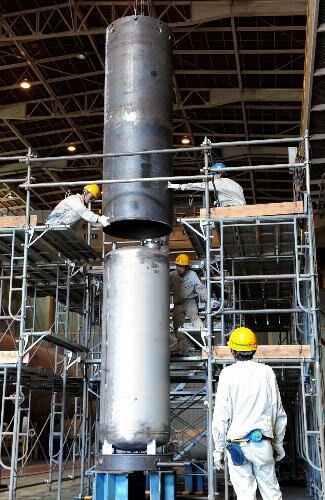 10 workers spent 2 minutes each to fix the PVC joint that broke off in AREVA's unit at Fukushima I Nuclear Power Plant on July 13, according to Asahi (link is in Japanese). The air radiation level at the location is 100 to 150 millisieverts/hour. For 2 minutes work, a worker could have received 5 millisieverts radiation. The on-again-off-again water treatment system is finally on again, but at this point all TEPCO cares about is probably that these Kurion-AREVA units keep hobbling along, at least processing the amount of water that's being injected into the RPVs (Reactors 1, 2 and 3) so that the highly contaminated water in the reactor and turbine buildings does not increase. SARRY stands for "Simplified Active Water Retrieve and Recovery System". Well, it doesn't quite stand for these words, but that's how Toshiba's been calling it. It is already being installed at Fukushima I Nuke Plant, and is expected to come online sometime in early August. As it is planned right now, this Toshiba's system comes after Kurion and before AREVA. SARRY is being jointly built by Toshiba, IHI, and the US company Shaw. A metal cylinder of 1.4 meter in diameter and 3.6 meters in height is filled with synthetic zeolite and titanium silicate. The system will connect these cylinders serially to decontaminate the water. The first half of the cylinders use absorbers with low percentage removal of cesium, and the second half of the cylinders use absorbers with higher percentage removal. Toshiba thinks SARRY can reduce the amount of radioactive materials in the water to one-millionth, and process 1,200 tonnes of water per day. The water will first go through the resin filters that remove oil, then through the cylinders filled with zeolite and titamium silicate for cesium removal. The system will be surrounded by lead panels to reduce radiation. Compared to Kurion's system which basically uses the same principle, Toshiba's system uses less pumps and thus less chance of breakdowns, according to TEPCO/Toshiba. The drawings are probably written in a language that TEPCO and workers understand without dictionary, and it is probably being installed by Toshiba and its affiliates who are building the system. If Toshiba's system delivers what it promises, there will be no need at all for Kurion or AREVA, and TEPCO can simply bypass both and just use SARRY. Kurion+AREVA can remain as a backup. We'll see if Murphy will get Toshiba. After all, processing 1,200 tonnes of water per day and reducing the radioactive materials in the water to one-millionth is what was promised with Kurion and AREVA's systems. Yomiuri has a video that Toshiba has released, showing the manufacturing and assembly of SARRY. Move over, Minami Soma City! The hay that's been fed to meat cows in one cattle farm in Asakawa-machi in Fukushima Prefecture, adjacent to Shirakawa City and about 60 kilometers from Fukushima I Nuke Plant has tested 97,000 becquerels/kg of radioactive cesium. 530 becquerels/kg of cesium have been also detected from the urine of a cow at the farm. This particular farm has sold 42 meat cows in 4 prefectures since April. Most of them have gone to the Tokyo metropolitan area (Tokyo, Kanagawa, Chiba) as meat cows, and Tokyo received the meat in addition from Sendai City after the cows that went there were processed. The Ministry of Health, Labor and Welfare, in charge of measuring radiation once the meat cows are processed into meat, will measure the radiation and will let us know if any exceeds the provisional limit. Fukushima Prefecture has asked the prefecture's cattle farms to stop shipping cows, on a voluntary basis. Fukushima Prefecture announced on July 14 that a cattle farm in Asakawa-machi in Fukushima Prefecture has been feeding the meat cows with highly radioactive hay. It's been also confirmed that this farm has sold 42 cows in Tokyo, Kanagawa, Chiba, and Miyagi Prefectures. They have been all processed into meat, and the meat has been also sold in Yamagata and Iwate Prefecture. Fukushima Prefecture has asked these prefectures to track the meat. According to Fukushima Prefecture, the Ministry of Health and the Ministry of Agriculture, max 97,000 becquerels/kg of radioactive cesium has been detected in the hay that has been fed to the cows at a cattle farm in Asakawa-machi. 530 becquerels/kg of cesium has also been detected from the urine of a cow at the farm. In Minami-Soma City, the amount of radioactive cesium detected from the hay was 75,000 becquerels/kg. The cattle farm notified the Fukushima prefectural government on July 12 that the farm was worried about the hay it purchased in April. The hay had been rolled by a dealer in the adjacent Shirakawa City between March 15 and 20, and sold to 4 cattle farms. The other 3 farms say they have never fed the cows with the hay. Fukushima Prefecture has asked the prefecture's 4,000 cattle farms not to sell or move the cows for the time being, on a voluntary basis. 35 cows out of 42 ate the radioactive hay, according to the farm. All 42 cows have unique identification numbers assigned. The Ministry of Health will collect the unsold meat, and will anounce the numbers IF the meat is found with radioactive cesium that exceeds the provisional limit (500 becquerels/kg). 1.4 kg in Miyagino District in Sendai City, Miyagi Prefecture. The meat in Miyagino District hasn't been sold and is kept in the warehouse. Most of the shipment to Sakata City is also in the warehouse. There has been no consumption of the meat in Yamagata Prefecture [hasn't been sold to consumers yet], and 17.9 kg have been sold to a meat wholesaler in Miyagi Prefecture. And it is likely that it will do so. Do not believe for a moment it is only within Fukushima Prefecture, because it isn't. Prefectures and municipalities that have found radioactive cesium in the ashes in the household garbage incinerators have already adopted the Fukushima standard as their standard, due to the lack of specific guidance from the government addressed to their specific localities. The Ministry of the Environment has already issued a guidance to mix the potentially radioactive debris with regular industrial waste and burn, so that the resulting ashes will test lower than 8,000 becquerels/kg cesium content. Now the limit will be 100,000 becquerels/kg; coupled with the mix and match operation, probably they can bury just about anything. Maybe even those radioactive debris and waste on Fukushima I Nuke Plant. According to the Guardian article on July 13, the workers at Fukushima I Nuke Plant are still removing 23,000 firefighter suits discarded around the reactors, packing them up, and shipping to a nuclear waste disposal facility. Why bother? Japan's Ministry of the Environment started the discussion on July 14 to raise the limit for radioactive cesium in the ashes from debris in Fukushima that are suspected to be radioactive in the wake of the Fukushima I Nuclear Plant accident. The current safety limit is 8,000 becquerels/kg of radioactive cesium. The Ministry is considering to raise this limit to 100,000 becquerels/kg. The Ministry will call a meeting of experts to come up with the conditions for burying the ashes safely, such as measures to prevent groundwater contamination. Last month, the Ministry announced its policy to allow the burying of the ashes as long as they test 8,000 becquerels/kg and lower, and to temporarily store the ashes if they exceed that level. However, with discoveries of ashes from regular household wastes that exceed 8,000 becquerels/kg in Tokyo and Chiba, the Ministry has decided to speed up on the policy on the disposal after the temporary storage. You can be assured that these experts would never object as a group. Probably there are one or two who will raise a token concern (that's their role), but the majority will give them assurance that it will be OK, and the Ministry will quote this expert group as the reason for its decision. I will look up information on the final waste disposal plant specs in Japan. I can almost bet there are no rubber liners or anything to prevent any leakage of toxic substance, not to mention radioactive waste that should be going to nuclear waste disposal facilities to begin with. Why do I think that way? Because if the so-called experts are thinking about putting in measures to prevent groundwater contamination, there is none, as of now. with the central pressure at 910 hectopascal (=millibar). It looks set to hit the southwestern Japan, but it is possible that it veers north once it hits Kyushu or Shikoku. I sure hope it won't go anywhere near Fukushima. While TEPCO and NISA may think Reactor 3 is totally safe for an earthquake, it may not be for a typhoon wind and rain. For Japan Metrological Agency's forecast, go here. Unlike the previous leaks (from the same place) where the PVC joint cracked (1st leak on July 9) and where the cast-iron joint corroded (2nd leak on July 12), TEPCO says that the PVC joint completely broke off. The company doesn't know when the water treatment system can be re-started, as the repair work needs to be done in a very high radiation environment (100 to 150 millisieverts/hour) and each worker can remain there only for 1 to 2 minutes. Well, this could be a lesson for the Japanese government who wants to push the so-called "stress test" on all nuclear power plants in Japan, assuming big earthquakes and tsunami. The pipe joints failed in three different ways: plastic cracked, cast iron corroded, and plastic broke off. If the government thinks the next nuclear disaster will happen the same way as the Fukushima accident, they may be very, very wrong. Just when I thought, "Maybe Murphy is taking a summer vacation away from Fukushima..."
In less than 4 hours from now, at 8PM JST on July 14, TEPCO will start injecting nitrogen gas in the Containment Vessel of Reactor 3. High radiation? So what? TEPCO is just too eager to oblige the national government who, for some unknown reason, believes injecting nitrogen gas in a still very unstable Reactor housed in a half-destroyed reactor building (which does not offer any protection when the radioactive materials inside the Containment Vessel get pushed out by the nitrogen gas) is an excellent proof that the winding down of the Fukushima I Nuke Plant accident is on schedule. Then the government can issue an order that will either eliminate, or reduce the size of, the "emergency evacuation-ready zone", declaring it safe for the residents. The cattle farm that ended up shipping radioactive meat cows all over Japan is located in the zone. 75,000 becquerels/kg of cesium in the hay and the area will be declared "safe". I hate to think how many workers at Fukushima I Nuke Plant, both TEPCO's and affiliates', have been pushed hard in a high radiation environment of Reactor 3 to do what seems to me like a ceremonial work to mark the end of the "step 1" of the "roadmap". TEPCO's headquarter job. TEPCO that can't say "no". On July 8, 2011, we received an instruction document, from Nuclear and Industrial Safety Agency (NISA), entitled "Instruction to submit reports related to injection of nitrogen to the reactor containment vessel of Unit 3 at Fukushima Daiichi Nuclear Power Station". Since NISA has evaluated the injection way we reported as being valid and the preparation for the injection has been completed, we will conduct the injection of nitrogen to the reactor containment vessel of Unit 3 from around 8 pm today. TEPCO assured the Nuclear and Industrial Safety Agency that its Reactor 3 at Fukushima I Nuke Plant, no matter how badly it has been destroyed, will withstand the earthquake for which it was designed for, no problem. NISA said OK we believe you. For TEPCO's summary, go here (it's in English). NISA has a more detailed summary than TEPCO, but it's only in Japanese. Neither has the actual report on the website, if there's one. (Reuters) - Gold surged to a record near $1,590 an ounce on Wednesday as the possibility of more Federal Reserve stimulus coupled with Europe's deepening debt crisis fueled bullion's longest winning streak in five years. Bullion's gains accelerated after Federal Reserve Chairman Ben Bernanke said the Fed is ready to ease monetary policy further if economic growth and inflation slow much more. Silver rallied nearly 6 percent, moving in tandem with commodities, U.S. stock markets and risk assets. ....Gold option volatility rose sharply on Wednesday, as bullion investors bet that underlying future contract prices could extend a record rally on signs of more Federal Reserve stimulus coupled with Europe's worsening debt crisis. COMEX gold options floor trader Jonathan Jossen said one investor sold a huge position in $1,600 December call options and then bought twice as much in $1,750 December calls. Heavy call purchases suggest buyers expect underlying gold futures to rise further. That option strategy is called "call backspread". Someone's expecting a very big and volatile move and wants to profit very handsomely. In the meantime, the Fed chairman was put in a very uncomfortable position trying to deny gold is money but say totally fiat Treasury bills are financial assets. ...As Bernanke began to sermon Rep. Paul on the history of the Fed (“we are here to provide liquidity [in abnormal situations],” the Chairman said), he was interrupted. “When you wake up in the morning, do you think about the price of gold,” Rep. Paul asked. After pausing for a second, Bernanke responded, clearly uncomfortable. that he paid much attention to the price of gold, only to be interrupted once again. “Gold’s at about $1,580 [an ounce] this morning, what do you think of the price of gold?” asked Rep. Paul. A stern-faced Bernanke responded people bought it for protection and was once again cut-off, with Ron Paul once again on the offensive. ...The interesting exchange served as one of the few times Bernanke has been publicly pushed off his comfort zone by an elected official. Rep. Ron Paul brought up the issues that he’s famous for, namely, a sort of allegiance between the Fed and the nation’s most powerful institutions, the illusion of fiat money, and the gold standard. Bernanke, angered and bothered, had no option but to respond. Apparently Fukushima had a program that helped the Fukushima residents to escape Fukushima during the school summer vacation (July, August) by subsidizing the cost of the hotels and bed and breakfast places (called "pension" in Japan, just like in continental Europe) in participating prefectures. This father had booked a pension in Shizuoka Prefecture, and was looking forward to sending his kids to a lower radiation location (well, relatively speaking, at this point). Then, he suddenly got a call from the pension, on July 12, and was told they had to cancel his reservation because they received a notice from Fukushima Prefecture not to accept temporary summer evacuees from Fukushima. Why on earth Fukushima would want to do this? To irradiate children more? he wonders, and remembers Dr. Shunichi Yamashita, who was on the radio all the time in Fukushima preaching safety ever since the nuke accident started on March 11 which totally brainwashed the residents in Fukushima. So he tried a hotel in another part of Shizuoka to see if he could make a reservation. The answer was no. But he found out from the hotel people that the pension that had canceled his reservation and others like that in that particular city had been booking the temporary evacuees from Fukushima without approval from the local government. The temporary summer evacuation will have to be approved, from now on, by both Fukushima Prefecture and Shizuoka Prefecture, and it will be approved only for people who are considering permanent evacuation due to high radiation levels. Fukushima Prefecture is not banning the evacuation that the residents do on their own (i.e. without any government subsidy), but it wouldn't recommend such a move. Fukushima Prefecture has stopped the subsidy program for the temporary summer evacuation. The hotels and pensions that had been accepting the temporary summer evacuees from Fukushima will not receive subsidy any more that allowed for a lower room rate for the Fukushima evacuees, therefore they are canceling the reservations made under the program. In addition, Fukushima Prefecture has asked other prefectures to shut down the evacuation shelters for Fukushima residents by the end of this month, citing the reason as "temporary housing within Fukushima Prefecture available". He's still looking for a place to send his kids and his wife for the lower-radiation summer somewhere. But since the subsidy has been cut off, not many places are willing to take reservations. Is there anyone in Japan, or anywhere in the world for that matter, willing to take his family for the summer? And many others like them? I have a distinct feeling that Japan is getting totally unhinged. Consider these news summaries. Consider them together. Do they make sense to you? Yes they do, don't they? The combined message is this: Let's all rejoice in the radiation, it's good for you and your children. If we all have it everywhere, millions of becquerels of it, that's only fair and equitable. The PM assistant and the current Minister in charge of the nuclear accident at Fukushima I Nuke Plant Goshi Hosono is going to announce the abolition of the "emergency evacuation-ready zone", because "the 1st step in TEPCO's "roadmap" has been mostly successfully implemented". Fukushima Prefecture has announced it will shut down the official shelters within Fukushima, which will force the evacuees to go back to their own homes. The national government will spend 100 billion yen (US$1.26 billion) to observe the health of 2 million Fukushima residents for 30 years, instead of evacuating them ASAP. About 1600 yen (US$20) per year per resident. Life is cheap. Since the national government is utterly broke, it will be ultimately paid for by the taxpayers of Japan. Remember, Dr. Shunichi Yamashita will be the vice president of the Fukushima Medical University who will do the observation and research. By the way, Matsudo City in Chiba is simply doing what the Ministry of the Environment has decided - mix and match. If the garbage or debris is likely to exceed the 8,000 becquerels/kg limit, burn with other stuff and lower the number. If it's already in ashes, mix them up with lower radiation ashes. When the Ministry of the Environment decided this policy, the Minister was Ryu Matsumoto, who's now in hospital after resigning from his post as the Minister of Recovery and Reconstruction. Fast and furious. Shock and awe. I think most people in Japan still cannot fathom how their elected officials and government workers with high education from distinguished schools (Tokyo University, Kyoto University, Oxford University...) could do such things to them. Better wake up really, very quickly. People say that the Japanese are law-abiding citizens. The Japanese say that to themselves. The truth, as has been slowly revealed over the past 4 months, is that they are followers of the arbitrary and capricious orders, as long as the orders are given to them from the government sources. Never mind if those orders are very much counter to the law itself or the natural law or the common sense. The beef from the meat cows sold by this particular cattle farm has been sold in at least 12 prefectures, with 428 kilograms (944 pounds) of it consumed at least in 8 prefectures. The Osaka prefectural government announced it had found 4,320 becquerels/kg of radioactive cesium in the meat from one of the two cows that was sold by a meat dealer in Osaka. The meat from the other cows also tested 3,710 becquerels/kg. None of the municipalities are going to disclose which meat shops or supermarkets or restaurants have sold the meat. "The provisional safety limit assumes the continuous consumption for a year. If you eat it only once, there is no need to worry at all," says the Tokyo Metropolitan government. Well, if only people knew they ate only once. So now, nearly 9 times the provisional safety limit, which already assumes 5 millisieverts/year radiation, is considered totally OK by the government officials. They are sanctioning, therefore, 45 millisieverts/year radiation for the Japanese residents and declaring it's no big deal. Japan has always been fond of calling an event or news or phenomenon as "Ichi-oku" - something. "Ichi-oku" is 100 million in Japanese unit, the number of the total Japanese population. Now they have "Ichi-oku so genpatsu rodosha　一億総原発労働者" - the entire population of Japan becoming nuke plant workers. If you read Japanese, here's what Mainichi has come up with as to where this beef has gone and how much. Again, no name of the stores or restaurants. I'll look around on Twitter if anyone leaked. Another pipe with similar coupling as the one that leaked on Saturday and Tuesday leaked, causing the contaminated water treatment system to stop. The leak was found at at 1:34PM JST on July 13 near the coupler that joins the hose that injects chemical to AREVA's coagulation/coprecipitation unit. The cause of the leak is being investigated, and it is not known when the system will be re-started. The cooling of the reactors using the treated water continues regardless. Since it is so much like the other leaks, no major newspaper carries the news online. Not even NHK. They may all think it's about the place that leaked before. On June 3, a meat shop in Fujisawa City in Kanagawa Prefecture bought 304.5 kilograms of beef from a cow raised in the same cattle farm in Minami Soma City in Fukushima Prefecture whose meat tested 3,200 becquerels/kg cesium on July 9. The meat shop sold some to their retail customers, but most of it was sold to shops in other cities including Kawasaki City and Sagamihara City. The meat also went to Minami-ku in Yokoyama City, and some unnamed locations in Tokyo. The beef contained 3,240 becquerels/kg of radioactive cesium. As I reported in the previous post, Yokohama City fed the school children with beef from Fukushima until July 11. According to the Fujisawa City Health Center, a meat shop in the city bought the beef (304.5 kilograms) from a cow [from the same cattle farm in Minami Sanriku City, Fukushima Prefecture]. Part of it was sold at the shop to the retail customers, and the bulk of it was sold to meat shops in Kawasaki City, Sagamihara City, and other places. From the remaining meat, 3,240 becquerels/kg of radioactive cesium was detected. The provisional limit is 500 becquerels/kg. By July 12, the Sagamihara City Health Center confirmed that the beef had been sold to 3 locations in one of its wards, Minami-ku. They are supermarkets and restaurants. 77 kilograms of beef had already been sold. The city will continue to investigate, but they are not very concerned, as "it is not the level to cause any damage to health". Yokohama City has also confirmed that it was sold to a meat shop in Minami-ku. Of 64 kilograms of the meat that the shop bought, 11 kilograms of the beef still remains at the shop, and the city has instructed the shop to keep the meat. Kawasaki City has confirmed 38.8 kilograms of the meat to a wholesaler in the city. The wholesaler sold the meat to shops in Tokyo, and the city informed the Tokyo Metropolitan government of the name of the wholesaler. 3,240 becquerels/kg cesium won't affect the health, declares the public health officials. I sure hope citizens of Sagamihara City will hold them accountable. Fujisawa City's press release and Asahi Shinbun article give you headache, because the numbers don't match at all. If you believe Fujisawa City, 73 kilograms were sold to customers in Fujisawa, and 64.3 kilograms were sold to customers outside Fujisawa. If you believe Asahi Shinbun, the meat shop in Minami-ku, Yokohama sold 53 kilograms and 3 outlets in Sagamihara sold 77 kilograms to retail customers in their respective cities. None of the shops who sold the contaminated beef is named. The reason? Because "Even if you eat this meat, I don't think there is no immediate danger to one's life" (official in Yokohama City, as reported by Tokyo Shinbun), so there's no need to name the shop. Already, many Japanese have finally stopped believing official words. If they see this kind of absolutely idiotic response, they will either stop buying any domestic beef entirely (or pork or chicken, for that matter, as many have evacuated from Fukushima), or demand that the meat shops, supermarkets that they buy from clearly tell them where the meat came from. Children from nursery schools and kindergartens up to junior high schools in Yokohama City had already been fed the beef from Fukushima since late April. Then the news of radioactive beef from Minami-Soma City broke a few days ago. The news, which had been dismissed by many as "baseless rumor" and some sort of "urban legend" in Yokohama and elsewhere, has finally been reported on Mainichi Shinbun Japanese more or less (less) on July 12. An anonymous reader of my Japanese blog, who turned out be a councilman (no party affiliation) of the Yokohama City Council, commented on my blog entry on July 9 that discussed the contaminated beef and radiation exposure of children. Regarding your post, I'd like to alert you to the fact that a large quantity of beef from Fukushima Prefecture has been used in school lunches in Yokohama City, without citizens and parents informed. We are living everyday trying to protect our lives, and with bitterness and regret at our powerlessness. Please spread the news. In mid May, Yokohama announced it would measure radiation in food items that go to school lunches, but the only food items tested would be those grown in Yokohama [i.e. none or close to none]. For vegetables and meat from Fukushima Prefecture, the city considered "safe" because they were tested in Fukushima Prefecture. In late May, the councilman and many of the people who commented on the board were afraid that the city was using radioactive food stuff for school lunches. But there were many posts from people who said "Oh come on, it's just a rumor, and without a solid data from the government officials we shouldn't speculate. You're all over-reacting." There was even a post from a teacher (as revealed by the IP address, apparently using a school computer) who trashed people who were worried about the food safety for children, with a vulgar, yakuza-like language. There were messages from parents who had their children carry their own lunches and water bottles to schools and kindergartens, and the schools denied their children to consume those homemade lunches and water. The mayor of Yokohama and the Board of Education president answered the councilman in a meeting that they considered the food items used for school lunches "are safe, because they are sold in the market", and that they had instructed the school principals to answer the parents that way when they asked about the safety of school lunches. Then, in early June, the City of Yokohama relented to mounting complaints from the parents and people like this councilman, announced that it would conduct sample testing of the food items for school lunches. At the same time, though, it announced that it would use food items from the disaster-affected areas (i.e. Fukushima) to show support. Some parents went to ask their school principals and teachers. "Why aren't you doing something to find out if the food is safe?" Their answer? "Well, everyone's eating it." In the meantime, schools started to prepare for swimming classes in their swimming pools, and not to waste pool water that had been in the pools, they used it to water the school gardens and yards, to the horror of parents who were called "monster parents" for worrying "too much" about radiation. On June 5, an insider leak to the coucilman from a concerned food stuff dealer. The dealer provided the unique identification numbers for the cows whose meat was used in Yokohama's school lunches. They were all from Fukushima. Why would Yokohama City use Fukushima beef for children? Because it was cheap. Because consumers didn't want to buy Fukushima beef if they see it on the supermarket shelves, the price of Fukushima beef had plummeted by 40 to 50 percent. No one wanted it, price went down, a cost conscious city and schools and kindergartens and nursery schools bought it to feed small children, without telling them or their parents the meat was from Fukushima. The city continued to do absolutely nothing. In mid June, the councilman got another piece of information: prior to the Fukushima I Nuclear Plant accident, there was NO USE of Fukushima beef in school lunches in Yokohama. After the accident, the price of Fukushima beef plummetted. Meat dealers got the cheap meat, sold it to the city, pocketed the very fat margin. Schools, both private and public it looks like, fed small children with the potentially contaminated beef, with the tacit approval of the mayor and the Board of Education. Aside from the radioactive school lunches, the city also planned to send city's children to a summer school in Ibaraki Prefecture, where the air radiation was more than 10 times the "official" Yokohama number (measured on the top of a 5-story building). The personnel at the summer school privately told the councilman, "I wouldn't recommend it..."
The councilman and concerned parents continued to push for radiation survey of food items for school lunches, but the only items tested by the city were those grown anywhere but Fukushima. Then, in late June, the councilman reported the result of the meeting at the Board of Education. All the beef from Fukushima that went to school lunches in Yokohama from April 23 to June 7 came from the planned evacuation zone in Fukushima. There were 916 cows from the zone. None of them exceeded 5,000 cpm in surface radiation, but none was tested zero. All were contaminated. The information was obtained by tracing the unique identification numbers for the cows. On July 9 in Japan, the news broke that the meat from a meat cow from Minami Soma City was found with radioactive cesium of 2300 becquerels/kg, almost 5 times the provisional safety limit (500 becquerels/kilogram). All Fukushima-grown beef that was served in school lunches in Yokohama City was contaminated. The contamination that was checked at the time of shipment from Fukushima Prefecture was only the surface radiation of a live cow, and there was no information as to the contamination after the cow was processed into meat. School children have already ingested this meat. There was a leak from some school nutritionists of this fact. But the city, the city's Board of Education and the school principals "lied" by saying "food items for school lunches are safe, because they are sold in the market." As the result, elementary school children in Yokohama City have been internally irradiated. Finally on July 11, Yokohama City decided to stop using beef in school lunches. Caveat? They will stop for the month of July, and they will use pork instead, as if pork is safe. The last lunch will be on July 15, then it's summer break. The city's Labor Union (which includes city workers who prepare school lunches) has issued a statement protesting ... (don't hold your breath) ... the city's decision to stop using beef, as it "will spread the baseless rumor". One or two detractors on the councilman's board who have been the apologists for the government seem to have disappeared after the news of 78,000 becquerels/kilogram cesium in the hay fed to the cows. My superficial image of Yokohama as upscale, cosmopolitan city on the Tokyo Bay waterfront was just that: superficial. The councilman's own website is here (Japanese only). The Mayor of Yokohama is a 65-year-old woman who was the CEO of Daiei, with many top positions mostly in auto industry before and after, with only her high school diploma. Quite an achievement. Too bad she has been totally tone-deaf on things that doesn't make money, like testing for radiation for the sake of children. Parents of Yokohama City, please do consider home schooling. Don't even bother sending your children to schools that clearly care more about their bottom lines than children. It turns out the July 12 leak in AREVA's coagulation/coprecipitation unit was from the same location where the July 10 leak had happened. If you recall, the July 10 leak was from the cracked PVC coupler that connected the PVC hose and a small metal tube welded to the bigger metal pipe. TEPCO replaced the PVC coupler with a metal coupler. Well, that metal coupler, made of cast iron, was corroded away by ferric sulfates in the chemical fed through the hose in less than 2 days, and started to leak again. So, the July 12 version of the leak fix was to replace this corroded cast iron coupler with the stainless steel one and hope for the best. TEPCO's Matsumoto said in the press conference on July 12 that they didn't think the cast iron coupler would corrode because it had metal plating. About 10 liters of the contaminated water and the chemical had leaked before the system was stopped. It's so deja vu that I didn't even realize the news is for today. Another pipe with similar coupling as the one that leaked on Saturday leaked on Tuesday morning, July 12 in Japan, causing the contaminated water treatment system to stop. So, when TEPCO did the repair on that joint on Sunday their time, and said there were at least 6 others like that, the company didn't bother to change the other 6 at the same time. So I guess there may be at least 5 more leaks to go. TEPCO announced on July 12 that the contaminated water treatment system stopped at 8:51AM at Fukushima I Nuclear Power Plant. A leak was found near the coupler that joins the hose that injects chemical to AREVA's coagulation/coprecipitation unit. The cause of the leak is being investigated, and it is not known when the system will be re-started. The cooling of the reactors using the treated water continues regardless. According to TEPCO, a worker noticed the leak at about 8:40AM, and manually stopped the system. The leak was near the spot where 50 liters of contaminated water with chemical had leaked on July 10. The PVC coupler had been replaced with a metal one, and the system was re-started after 13 hours. It is not known if today's leak has anything to do with the previous leak nearby. Remember the worker at Fukushima I Nuclear Power Plant who collapsed on the second day on the job and died on May 14, without any treatment for nearly 3 hours because 1) there was no doctor at Fukushima I Nuke Plant; 2) no ambulance would come to the plant so TEPCO drove him to J-Village which is 20 kilometers away; 3) there was nothing they could do at J-Village so finally they put him on an ambulance to a hospital in Iwaki City, 48 kilometers from the plant and 28 kilometers from J-Village? And his death was due to a heart attack, we were later told. The following is my liberal redaction mixed with my observation of the Mainichi Shinbun Japanese article (7/12/2011). If you read Japanese, go read it. I just cannot do the literal translation, as it is too painful. Well, the worker was Mr. Nobukatsu Osumi, 60 years old at the time of his death, of Omaezaki City in Shizuoka Prefecture. He had worked in various nuclear power plants as a plumber. He was hired by a subcontractor 4th-degree removed from the original contractor to work at Fukushima I Nuclear Power Plant as a temporary worker. He was one of those nameless workers who support the operation of nuclear plants in Japan, moving from plant to plant and doing necessary maintenance and repair work. They used to be called "Genpatsu (nuke plant) Gypsy" in Japan. More recently, they were called "Fukushima 50". On the first day of his work on May 13, his shift was from 6AM to 9AM. His job was to work on the pipe installation in the Central Waste Processing Facility (where the contaminated water treatment system was being set up). On the second day on May 14, he collapsed as he was carrying a special cutting tool with a colleague, and never regained consciousness. As I said, there was no doctor on site, and there was no ambulance that would come. The hospitals in the area nearby had been evacuated or abandoned. Since he died of an illness, not an injury, neither TEPCO nor Toshiba, the original contractor whose 4th-degree subcontractor hired Mr. Osumi, has paid any compensation to his widow, 53-year-old wife from Thailand. And it is the wife, with the help of an attorney, who has filed for the worker's compensation claiming her husband's death was due to the excessively heavy workload in a very short time period and should be recognized as "industrial accident". She says her husband did not have any particular health problem. When she saw her husband's body at the morgue at the Fukushima police station, both his ears were in deep purple color, and there were cuts on the face and the chin. But it was determined that the cause of death was illness, and there was no compensation. TEPCO says there's not much connection between the nature of the work and his death. Toshiba says there's not enough information to link the work condition with his death. TEPCO says his radiation exposure was low, at 0.68 millisievert. 0.68 millisievert in less than 3 days is LOW? Since he had worked at other nuclear power plants over the years, his accumulated radiation exposure may have been significant. The last conversation they had was on the night Mr. Osumi arrived at Fukushima I Nuke Plant. Mr. Osumi told his wife that he would work for 2 more years, then they would go to Thailand and become farmers, as his wife does not read or write Japanese well. The wife feels tormented for having sent her husband off to a place she didn't know was dangerous. She still works as a part-time worker at a bento (lunch box) factory from 5AM to 7PM, sometimes to 10PM, and earns 130,000 yen (about US$1,600) per month. She says she doesn't even know how to go to places without her husband. She still lives in an apartment she shared with her husband, but now when she comes home there is no one who would cheerfully greet her. Not a cent for a lowly worker who worked and died at Fukushima I, but the ex-president of TEPCO can get $6 million upon retirement, or so it is rumored. Not a very proud moment to be a Japanese. I have a mixed feeling about this. Much as I despise some of the top management at TEPCO, I wouldn't cheer for having the employees eat vegetables grown in Fukushima Prefecture, as part of the company's effort to support the prefecture's producers. The company has the dormitories for bachelors. The Japanese robot "Quince", who got stuck on the stairs leading to the Reactor 2 basement and had to be rescued by carbon colleagues back in June, completed a successful mission of entering the reactor building in Reactor 2, and this time climbing up the stairs to the 2nd and the 3rd floors, and measuring air radiation. The feat was accomplished on July 8. Air samples taken on the 2nd and 3rd floor still have slight amount of iodine-131, and a lot of radioactive cesium. The measurement unit is becquerels per cubic centimeter. TEPCO says the radiation is too high for human workers (up to 50 millisieverts/hour), which is a bit odd considering the company didn't have any problem sending in human workers into Reactor 1 which had the radiation level as high as 1,000 millisieverts/hour (or 1 sievert/hour) on the 2nd floor of the reactor building, and the 1st floor was not much better. But that was back in the beginning of May. TEPCO's sudden unwillingness to have the workers risk radiation indicates to me that the company may be running thin on skilled workers with low radiation exposure, both at TEPCO and affiliate companies, and wants to conserve on the radiation dose for them. In the press conference on July 10 (morning), I heard them say they are not letting workers continue to work once they exceed 150 millisieverts of cumulative radiation exposure, even if the regulation has been relaxed to 250 millisieverts after the accident. Beef from 6 cows from the same cattle farmer in Minami Soma City in Fukushima Prefecture have already been sold at least in 9 (not 5) prefectures, according to Mainichi Shinbun Japanese latest update (1:28AM, 7/12/2011). Unlike the 11 cows whose meat all tested cesium exceeding the provisional limit of 500 becquerels/kg, the meat from these 6 cows had never been tested and allowed to circulate in the market. The Ministry of Agriculture, Forestry and Fisheries is in charge of testing live cattle, and the Ministry of Health, Labor and Welfare is in charge of testing meat. They do not talk with each other. And as usual, the Ministry of Health, Labor and Welfare assures us that "it won't affect health unless you eat it on a continuous basis." The Ministry conveniently forgets that the radiation is everywhere - air, soil, water, sludge, garbage, tea, vegetables, fish, meat. If people can just eat this contaminated beef and not breathe, not eat and drink anything else, it still may not be "safe". The beef has been confirmed sold in: Hokkaido, Tokyo, Kanagawa, Chiba, Shizuoka, Aichi, Osaka, Tokushima, Kochi. It was discovered by the Tokyo Metropolitan government that the meat from 6 cows sold by the same cattle farmer earlier had been sold to wholesalers and retailers in 5 prefectures. Further, it had been in the market in additional 4 prefectures (total of 9 prefectures). Over 148 kilograms of meat have been sold. The Ministry of Health, Labor and Welfare says, "There is no effect on health unless it is consumed continuously in large quantities." The Shizuoka City Public Health Center announced on July 11 that 1,998 becquerels/kg cesium was found in the meat purchased by a wholesaler in the city, who purchased 27.8 kilogram of this beef. Part of the meat has already been served to customers in restaurants. The Tokyo Municipal government detected 3,400 becquerels/kg cesium from the meat that a wholesaler in Tokyo had kept. That is 6.8 times the provisional safety limit of 500 becquerels/kg. The Osaka government also announced on July 11 that the meat from 2 cows from the cattle farmer had been sold, mostly within Osaka. Several kilograms of the meat had been given as gifts and probably been consumed already. In Yokohama City in Kanagawa Prefecture, 52 kilogram of this meat was sold in retail stores. According to the Ehime government, a wholesaler in Ehime sold 17.6 kilograms of the meat to supermarkets in Kochi and Tokushima Prefectures, who then sold the meat to consumers. It is not known whether any has been sold within Ehime Prefecture. Regarding the case of radioactive cesium in excess of the national provisional safety limit in the beef from the meat cow shipped from Minami Soma City in Fukushima Prefecture, 75,000 becquerels/kilogram of radioactive cesium has been detected from the hay that the cattle farmer used to feed the cows. The farmer kept the hay outside after the Fukushima I Nuclear Plant accident. Fukushima Prefecture continues to investigate. Photos speak words. These photos were taken by Akira, translation by Hiromi.. For their exchange, read Part 1 and Part 2 of the series. He's basically saying, "Bring it on!" [Continued from Part 1. Akira goes back to Kesennuma, and encounters a stereotypical bureaucracy in Japan even in the time of distress and misfortune at a local school, which the readers of this blog may be thoroughly familiar with. Hiromi and John, thanks for your efforts to help those who are in the areas impacted by this disaster. I just returned from Kesennuma. The town is a long ways away from recovery, but seeing groups of volunteers from around the country who were there cleaning up the debris made me feel that progress was definitely being made. People were much calmer. A few stores with minor damages were opening up for business. About the funds that you and your friends sent to me... I have disappointing news to tell you. You probably heard from Kugako that six kids from my old junior high school who were orphaned. We were planning to give the donations to them. We stuffed six envelopes with the money and the print-outs of your letter and everyone else's cards and messages. Then, on the day of our appointment to hand out the funds, we learned that our offer didn't get the approval of the principal. The teacher we were corresponding with and the vice principal welcomed our offer with open arms. But when they took it to the principal, he said the school was obligated to protect the students' privacy and therefore could not reveal the orphans' identities. He requested that we contact the foster families individually and ask them if they needed the money, and deliver it personally. Unfortunately I didn't have the time to do all that. So, I asked if I could leave the money with the school so that they could give it to the kids. The principal's response was that the only way the school could accept the money was if it was meant to aid the general student population, not just the orphans. Forgive me, Hiromi, but I was so upset with the principal's rigid attitude. I told him that I was sorry, but that I had just learned about other children affected by the tsunami who might be able to use the money instead. I said we would help their orphans next time. I decided to give the entire amount to my cousin Akane. I may have told you about Akane. She's a 35-years-old mother. She had her first daughter when she was 18, who is now a high school sophomore. She went through a divorce, then remarried and had two more daughters, thirteen and twelve respectively. Her second husband ran a fishing boat tour and rental operation in Minami Sanriku-machi, a town wiped out by the tsunami. Both their house and the store were completely destroyed, and the whole family now lives with Akane's parents for the moment. So they have a roof over their head, but her father (my uncle) has become jobless as well, so he can't really support them either. For a while Akane and her family had to visit the ruins of their house to dig up soiled clothes. They would wash them in the river so that they had something to wear. They still go back to see if they can find anything salvageable. They were feeling so uncertain about their future to continue living that way. So they decided to find a community who took in disaster victims and move there temporarily. It looks like they found a place in Hokkaido. So, I ended up giving the donations to my cousin and her children. Please forgive me for taking things in this direction. Kugako and I handed the money to Akane and her family along with your letters. We explained to them how people of different nationalities living in NY all chipped in to help. The amount was 100,000 Japanese yen. Because the exchange rate fluctuates, I threw in a little more. I also bought some clothes for the kids. I know I acted without your consent, but that is what became of your donations. I have a thank you letter from Akane. Would you mind having it translated and relay her message to the kind people? It is originally a two-page handwritten letter. I am Akane Onuma of Minami Sanriku-machi in Miyagi Prefecture. I am the recipient of your warm-hearted support. My heart is filled with gratitude that I cannot describe. I am in total awe and admiration of your generosity to offer such a large amount so readily to someone you have not even met. I wonder what I would do if I were in your place. Would I be able to act as you did? I am not convinced that I would be proud of my own answer to this question. As I find myself to be the recipient of such unexpected kindness, however, I am inspired to one day be as big a person as you are. It gives me strength to one day get back on my feet and to be strong and compassionate. The ocean rolled over the houses, the boats, the rice and vegetable fields, and even the rice crops that were harvested. I reflect upon the way we have only greedily taken from the sea and the mountains, and wonder if it is a punishment. They speculate that it will take five years before the faming fields and the beaches will be restored to what they used to be. Those of us who have made our livings from the sea have discussed taking responsibility to clean up the debris from the houses and boats that we have created. By doing so we hope to go back　toliving with the ocean and the mountains again. I am planning to use your invaluable donations to purchase boat engines. Our town is left with only four boats. If we can get just one small boat to work, a few people can get on it and start cleaning up the ocean. My uncle-in-law as well as my own uncles who live nearby believe the boats will be a tremendous help. My in-laws whom we shared the house with are living somewhere else right now. I am going to do all I can to somehow get a place where we can all live together again while they are still around. I look forward to working in the mountains and the sea as before. Money was not the only thing you gave us. You gave us the strength and spirit to keep going. We have made a resolution to pay it back when we have regained our strength by helping others in need. I will send you photos I took in Kesennuma and Minami Sanriku-cho. From April 28th to May 5th, my dear friends Akira and Kugako and their sons (12 & 18 years old) went back to Akira's hometown, Kesennuma, to visit Akira's family. His uncle was confirmed dead and his funeral was finally scheduled. Once things were settled with Akira's uncle death, Akira felt that he and his family could finally move forward. Food distribution for the town improved a little bit and his family are now able to eat some fruits and instant food. His 99-year-old grandfather started to ride a bicycle again since his motorcycle was taken by his second son. Kugako said she felt like she saw Hell in Kesennuma. Thank you so much for your generous donation and the love you sent to Japan. I really appreciate your complete trust in me and Akira & Kugako. I received $1500. I sent $1300 to them, with $200 left to be sent. We found this task was not that easy as we thought it was going to be. Please find the letters from Akira and his cousin, Akane. Akira has been really upset, but I'm happy to report that your donations went to people who really needed help. If you are not satisfied with the results by any chance, Akira will either refund the money or send equivalent funds to the organization which supports kids. Please let me know. I don't know what's going to happen to Japan, but I feel I have to keep doing anything I can do to help. Again, thank you so much for your amazing help. Sending Love from Akira, Kugako and the people who received the donations.